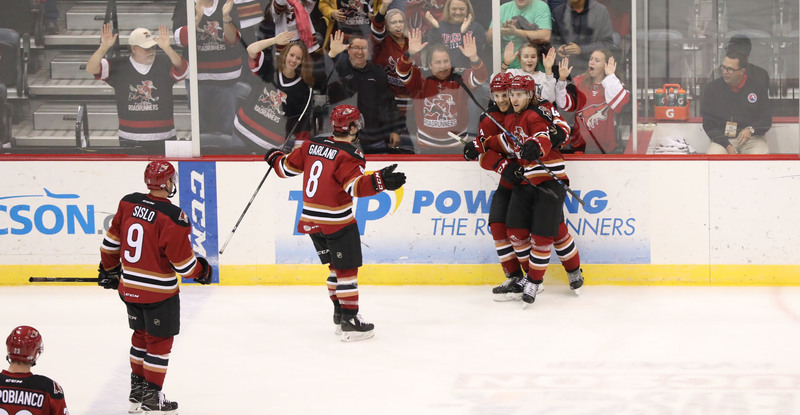 The Roadrunners clinched the Western Conference regular season championship on Friday night, their 3-2 victory over the San Diego Gulls at Tucson Arena guaranteeing home ice through the first three rounds of the Calder Cup playoffs, should they play so long. Mario Kempe’s go-ahead goal with 3:10 left to play in regulation, a gem of a shot, created bedlam amongst the 4,311 in attendance, energy the team fed off of to nix San Diego’s last-ditch rebuttal efforts. 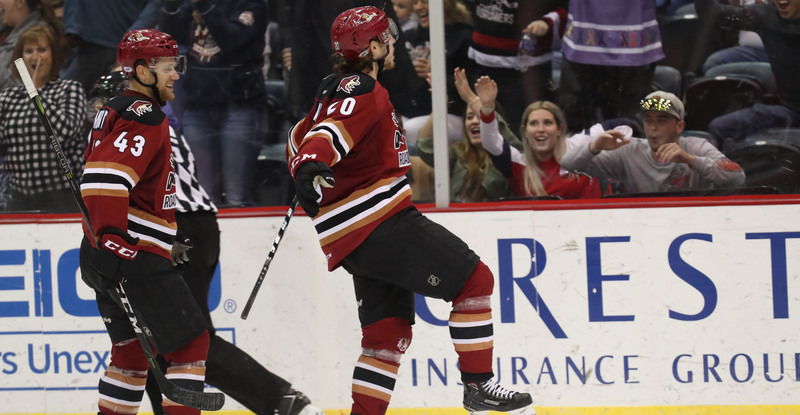 Dysin Mayo opened the scoring Friday night, flying up the ice to join a rush, receiving a cross-ice pass from Dylan Strome, and beating San Diego’s Kevin Boyle with a shot up-high to give the Roadrunners a 1-0 lead just over six minutes into the contest. Lawson Crouse’s secondary assist on Mayo’s marker extended his point streak to seven games. San Diego tied the game late in the first with a goal from Nic Kerdiles, snapping Adin Hill’s shutout streak at 162:34 minutes. With just over two minutes left to play in the second period, Mario Kempe shoveled home a Joel Hanley feed after sneaking behind coverage during a power play, giving the Roadrunners a 2-1 lead. The Gulls responded in the final seconds of the middle frame, tying the game 2-2 with 12.3 ticks left on the game clock. Tied in the final stages of regulation, Kyle Capobianco set-up Mario Kempe for the game-winner. Kempe, stationed at the right circle, computed Capobianco’s feed perfectly and unleashed a one-timed slap shot high and tight past Kevin Boyle to give the Roadrunners a 3-2 lead, a lead they would not relinquish. “I got a great pass right in my wheelhouse and I was just trying to hit the net high, and it worked out well,” Kempe said of his game-winning tally. With the win, the Roadrunners also locked up the I-8 Border Trophy. The teams will reconvene for the regular season finale tomorrow night at Tucson Arena, where the puck is scheduled to drop just after 7:05 PM.